GET A CUSTOM MADE RUG! Accent your home or living space with a beautiful rug from your latest hunting excursion. We always deliver superior results that will make you proud! Your trophy is important to us, so we apply our cutting edge techniques carefully and respectfully to preserve your trophy, and let you re-live your success for many years. 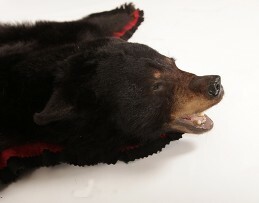 We offer our expert rug services for your trophy needs, from black/grizzly bear to fox. Our competitive rates will always fit both your budget and your lifestyle. We use only the most advanced processes and procedures to achieve high quality results for your trophy. Trust us with your prized game for the best in taxidermy and artistry.